The third chakra is situated at the base of the rib cage and is represented by the yellow Manipura mandala (jewel city), symbolised by birds. This chakra is the foundation of the metal body, enabling you to pick up the essences and vibrations from places, people and things. This chakra surrounds energy, self-control, personal power, emotional issues and issues of self-acceptance. The solar plexus chakra physically influences the stomach, muscles, digestion, liver, pancreas, gallbladder, nervous system and metabolism. If this chakra is in balance you have the capacity to accomplish your goals and enjoy the success. Here you can successfully wield your own will and power, which attracts balance and prosperity – allowing you to feel secure and safe. You’ll find you are more disciplined and able to deal with and are better organised when it comes to change – as all change leads to a better outcome. When life appears better, we are inspired and able to concentrate on learning. 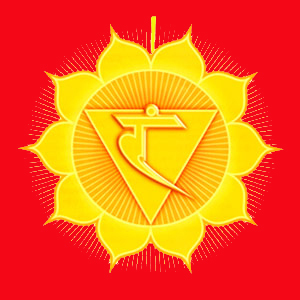 If there is an imbalance in the first and second chakra, there is likely to be a lack of balance in the third chakra. If there is a lack of flow this can create a negative influence on the physical – manifesting as digestive problems, ulcers, liver and pancreas complaints. This can also lead to frustration and anger and create problems dealing with authority and power. If there is too much flow of self-power you’ll experience anger and that everything feels like an uphill battle full of conflict. If there is too little flow of self-power everything becomes too demanding and you find others place too many demands on you. An imbalance of the third chakra highlights our understanding of our own inner workings, allowing one to look within and reclaim your own power and balance, which allows us to move forward with self-confidence. Do loads of dancing and shake those hips! Drink yummy teas like chamomile and peppermint tea.